The Co-op purchases a variety of seafood from over 140 inshore commercial fishing vessels including: Lobster, Snow Crab, Halibut, Ground fish and Mackerel. The majority of product is purchased from vessels that are locally owned and operated by Co-op members. The purchasing and processing of this product results in the direct employment of as many as 125 people in peak periods and contributes approximately $2 million in payroll to our local economy. 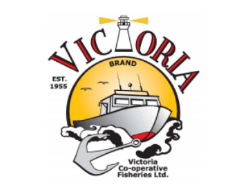 Victoria Co-op Fisheries is currently managed by Osborne Burke (General Manager) in co-operation with an Executive Management Committee comprised of three of the Directors of the Victoria Co-op. Overall the Victoria Co-op is governed by an 11-member Board of Directors. Fish harvesters make up 100% of the ownership of the Co-operative.